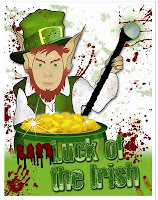 Over on Jim Wisneski's Soft Whisperings is a special anthology for today, "The UnLuck of the Irish". It features plenty of dark and disturbing twists on Irish folklore, including one by yours truly, entitled "What the Wind Knows, It Cannot Tell". Heh, it's worse than never having had a wish at all! Should you write in only one genre? Avatars - which one was the best? Who's afraid of O. Henry?